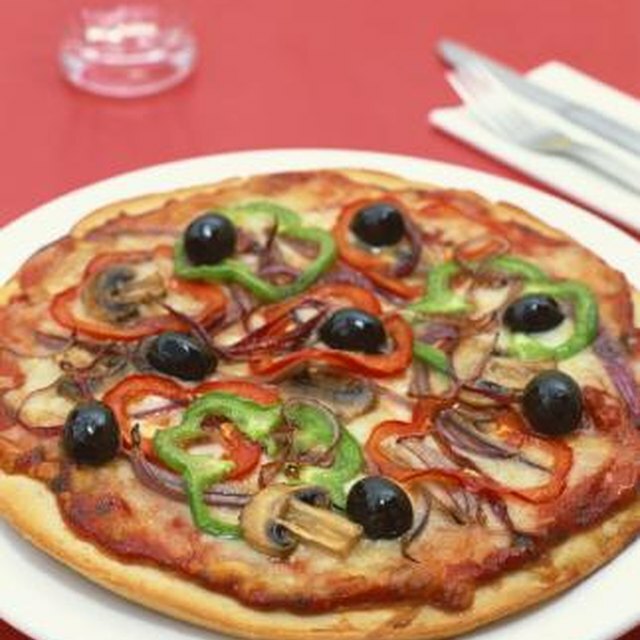 You don’t have to call pizza delivery in order to enjoy the savory taste of hot pizza; you can make your own. Many homemade pizza recipes feature thick, pan-style crusts, but with a stiffer dough, made from bread flour, you can have a wafer thin, crispy crust that won’t overwhelm the flavor of your sauce and toppings. This recipe makes enough dough for two large thin, crispy-crust pizzas. Combine the flour, yeast, sugar and salt in the large bowl of a stand mixer. If you don’t have a stand mixer fitted with a dough hook, mix the ingredients by hand. Add the water and oil to the dry ingredients and knead on low speed for 8 minutes. You may also knead the dough by hand on a floured surface. Place the dough in a bowl sprayed with non-stick cooking spray and lightly spray the top of the dough, as well. Cover the bowl with plastic wrap and let the dough rise up to 24 hours in the refrigerator to give the dough an artisan flavor. If you’re in a hurry, you can let the dough rise a couple of hours on the countertop, instead. Separate the dough into two equal portions and roll one portion out at a time. Generously flour the surface and keep extra flour on hand for dusting the dough. Roll the dough into a thin circle, approximately 14 inches in diameter. As you roll, pick up the dough, dust more flour on the surface, and flip the dough over every time the circle is about 2 inches larger. Roll from the center of the dough circle toward the edges to maintain uniform thickness. The dough will become very thin during the last few inches. Brush two large, 14-inch pizza pans, each with 1 tbsp. of vegetable oil. Preheat the oven to 475 degrees Fahrenheit. Lift a circle of dough carefully, and center it on one of the oiled pizza pans. Pinch the outside edge of the dough to form a “lip” on the crust to keep toppings on the pizza. Repeat with the other ball of dough. Add your favorite sauce and toppings, and bake for 20 to 22 minutes, switching the pizzas half way through cooking so the crusts brown evenly. The pizzas are done when the crusts are golden and the cheese is bubbly. During the rolling period, you should flour and flip the dough at least four times. For an extra crispy crust, bake only the crusts in the oven for five minutes before adding the toppings and baking for 18 to 20 minutes longer. If you have trouble lifting the thin dough, you can roll it loosely around a floured rolling pin or a section of broomstick that is wrapped with clean plastic wrap. Unroll the dough right onto the pan. If you don’t have bread flour, you can use all-purpose flour, but the crust may not be as crispy. 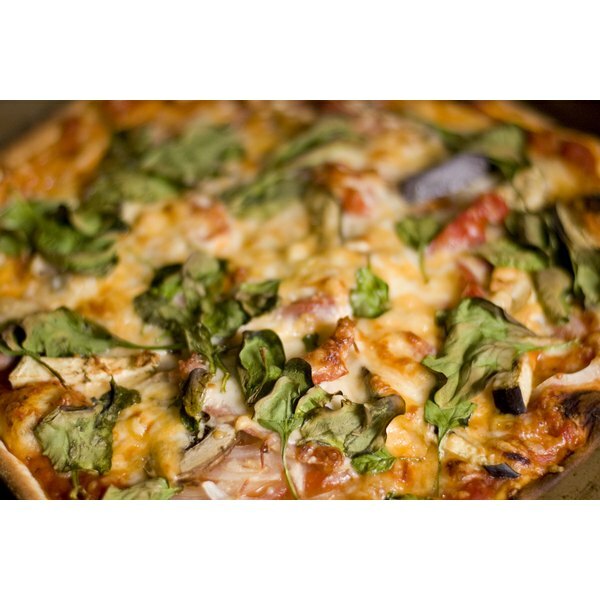 This recipe is not suitable for a thicker crust pizza because it does not contain enough water.